The AGV Horizon helmet is an aggressive evolution of the Stealth-SV and has added a number of new features. The internal sun visor retracts fully into the shell and is released by a lever on the outside of the helmet that's easy to use with gloves. Also new is the Dri-Lex liner that has a hygienic treatment that wicks away sweat. The new CarbonGlass shell is a mix of fiberglass and carbon fiber construction that makes for a lightweight, yet strong outer shell. 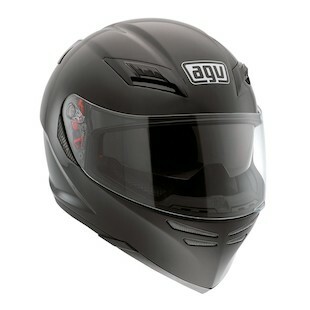 It's in the mid-range of the food chain for the AGV lineup and is a neutral-oval to round head shape. The integrated ventilation system is low profile but works well in venting and extraction. Listening to their customers, AGV continues to improve their products and provide value well beyond expectations. Also available in graphic versions: AGV Horizon Absolute, AGV Horizon Absolute Italy.